I was living in Ann Arbor at the time. A friend, who happened to be a drag king recommended I read Push. I hadn’t heard of the book or the author, Sapphire. I loved the cover, brick red background, bold black letters, simple. The first page had me. Claireece Precious Jones, the main character, grabbed me by the hand and told me not to let go. I didn’t. 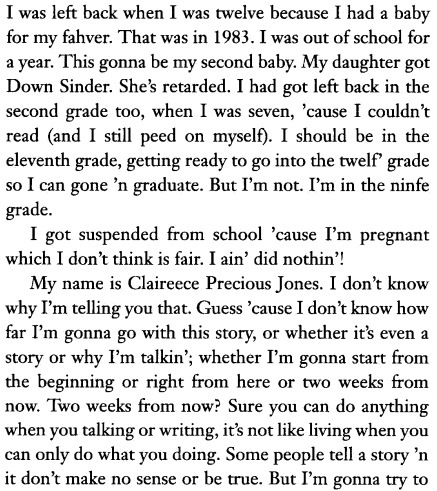 Claireece is repeatedly raped by father and abused by her mother. “Poor, angry, illiterate, fat, unloved and generally unnoticed,” she finds a way out of her situation and tries to better understand her life as it is. Sapphire writes with such a beauty that is painfully vivid. I held my breath reading some of the pages. I’ve been running away from Claireece’s, Eisha’s, Tameka’s, and Tyrone’s since I graduated from high school. Claireece could have been my neighbor when I was 8 or 18. She lives in the ghetto. My family lived in the ghetto at two very different times of my life. I am still running. Running and trying to escape the hardship that my mother and grandmother and relatives faced through writing. I had no idea Push was being turned into a movie or being directed by Lee Daniels. Lee Daniels is a outspoken gay Black writer, producer (Monster’s Ball), and director (Shadow Boxer) known for his crazy Maxwell-esque hair. I remember reading an article about him in Vibe magazine years ago about one of the projects he was working on at the time. Two years ago I went to see the premiere of his movie, Shadowboxer with Helen Mirren, Mo’Nique, and Cuba Gooding Jr. in LA. I was excited to hear that he directed and co-produced Push. Oprah calls Push the next Color Purple. I’m wondering why isn’t their more money behind this project. I haven’t even heard any bloggers talking about it. The buzz at Sundance was that Mo’Nique might be considered for an Oscar for her performance in the movie. Mo’Nique has developed a gainful relationship with Daniels and so has Mariah Carey. Carey plays Krystal in the highly anticipated Tennessee, which Daniels produced. Tennessee is directed by Aaron Woodley. The movie was premiered at the Tribeca Film Festival and showed at the Urbanworld Film Festival. Tennesse is the film that Janet Jackson gained weight for “and then had to drop out b/c they moved production. Sounds like bull to me. But it’s funny that they replaced her with Mariah, who isn’t gaining any special weight for it seemingly. Guess she’s big enough,” said sledwidge on IMDb’s Message Board. Push stars Gabourey Sidibe, Paula Patton, Mo’Nique, Mariah Carey, Sherri Shepherd, and Lenny Kravitz. How did I not hear about this project? Claireece Precious Jones is portrayed by Gabourey Sidibe, a new actress from Harlem. Push is slated to be released later this year. Coincidentally, there’s another film titled Push with Djimon Hounsou and Dakota Fanning that has released last week. Hounsou’s Push is a Sci-Fi thriller about young kids with special powers. Push is the recipient of the Grand Jury Prize: U.S. Dramatic, the Audience Award presented by Honda: U.S. Dramatic, and A Special Jury Prize for Acting at the Sundance Film Festival and was nominated for Best Trailer by the Golden Trailer Awards. It’s one of only three films to win both the Audience Dramatic and Jury Awards at Sundance.